During FY 2014, the SOCCENT Commander requested a short-term effort to understand the psychological, ideological, narrative, emotional, cultural, and inspirational (“intangible”) nature of ISIL. As shown below, the SMA1 team really addressed two related questions: “What makes ISIL attractive?” or how has the idea or ideology of ISIL gained purchase with different demographics; and “What makes ISIL successful?” or which of the organization’s characteristics and which of the tactics it has employed account for its push across Syria and Iraq. The effort produced both high-level results and detailed analyses of the factors contributing to each question. The central finding was this: While military action might degrade or defeat factors that make ISIL successful, it cannot overcome what makes ISIL’s message and idea attractive. The complete set of products from the effort is available by request from Mr. Sam Rhem in the SMA office (samuel.d.rhem.ctr@mail.mil). Given that when the dust settles and some degree of durable stability has been established in the Middle East, it will no longer look as it did prior to the start of the Syrian civil war and the rise of ISIL; therefore, the question is what will the Middle East look like, and how is it likely to operate both within its own regional community and in interactions with external powers and actors, after the ISIL threat has been defeated and the Syrian Civil War has come to an end. 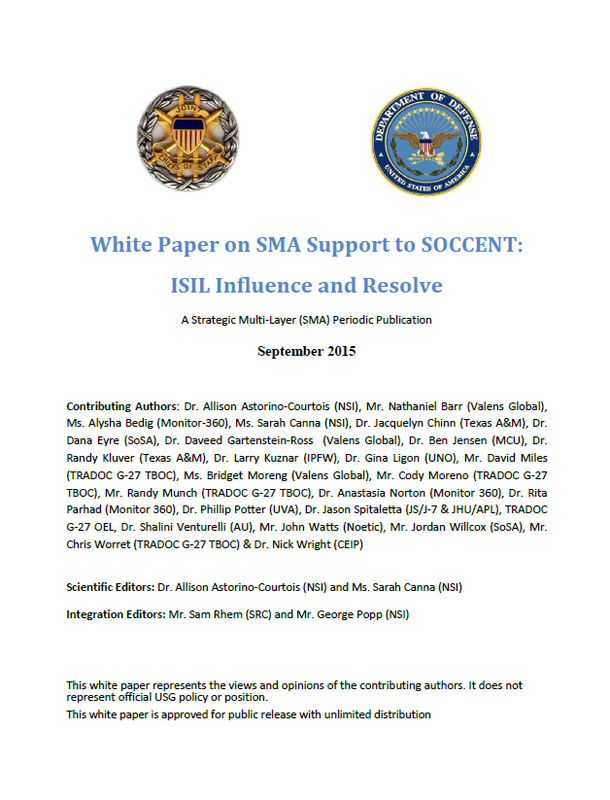 The articles in this white paper summarize work on going and completed by different SMA-affiliated teams in response to this request. The focus is primarily on one of the regional actors: ISIL and the nature of that organization’s interests, influence capabilities, support, and resolve. There has not yet been an effort to consolidate the insights presented by each of the pieces. Rather, they are presented as stand-alones from which analysts and practitioners might gain insight. A final project report including additional regional actors will be available from the SMA office in December 2015. SMEs believed that ISIL’s capacity to control is based on several factors. • Fear and coercion: ISIL has a monopoly over the use of force in areas it “governs.” It uses the implicit and explicit threat of violence against civilians to ensure acquiescence. • Provision of better governance and order: Some argue that ISIL provides better governance and essential services than what was experienced under Iraqi and Syrian rule. Furthermore, ISIL provides some degree of stability and order in a previously uncertain environment. • Lack of a viable alternative: There are no alternative forms of Sunni-empowered governance available. ISIL draws on the power of collective Sunni identity and Sunni grievances to establish its legitimacy. • Strong leadership: ISIL has a strong, agile, pragmatic leadership and organizational structure. It has a highly motivated and a dedicated rank and file under the leadership of a disciplined and experienced cadre, supported by consistent and compelling messaging. • Success breeds success: ISIL’s momentum and its ability to survive coalition attacks to date plays a role in convincing civilians and local power brokers that it will be around for the long-term, which reinforces support or acquiescence to ISIL, which further reinforces ISIL’s capacity to control. ISIL’s capacity to control is largely based on its interaction with the local population. However, ISIL also enjoys sympathy, support, and recruits from the global Sunni Muslim population. SMEs interviewed felt that the primary way ISIL achieves support from the global Sunni Muslim population is through persuasive use of narrative. SMEs identified over 20 narratives ISIL uses to persuade, the most powerful of which are described below. Narratives are messages that represent the ideals, beliefs, and social constructs of a group. ISIL uses them within the civilian population to consolidate control and amongst the global Sunni Muslim population to garner sympathy, support, and recruits. • Moral imperative: ISIL uses a variety of narratives to convey the idea that Muslims have a moral imperative to support them. These narratives include the restitution of the caliphate, creation of a utopian society based on Muslim laws and values, ISIL as a representative of the pure form of Islam, ISIL bringing back the Golden Age of Islam, and that ISIL’s caliphate will unite all Sunni Muslims. • Sunni grievances and victimhood: ISIL uses shared feelings of marginalization, repression, and lack of power to gain legitimacy and support. They draw on sub-narratives of victimization among Sunnis at the hands of Shias and the West to cement this powerful narrative. • Immediacy: ISIL rejected al Qaeda’s core narrative that it needed to wait for the right time to establish a caliphate. ISIL did it within months. ISIL touts its willingness to take action, combined with its success in establishing what it calls a caliphate, as evidence of their proclaimed righteousness. • Reinvention of self: No matter what kind of life you led, when you convert to Islam and join the fight, all previous wrongdoing is washed away. ISIL offers a new start and a new sense of identity and purpose to anyone who joins them. • Thrills, adventures, and heroism: Some individuals are particularly drawn to ISIL because it advertises thrills, adventures, and opportunities for heroism (and violence) that appeal to some young men’s sense of masculinity. While these factors represent areas of qualified agreement on key factors explaining ISIL support, SMEs differed on which factors were the most important, which led to two primary schools of thought regarding ISIL’s longevity. 1. ISIL has resilient properties via its capacity to control people and territory stemming from pragmatic leadership and organization, intimidation tactics, tapping into existing Sunni grievances, and use of a well-developed narrative and media outreach to attract and motivate fighters. 2. ISIL is not a durable organization. It has taken advantage of a pre-existing sectarian conflict to acquire land, wealth, and power. It only attracts a narrow band of disaffected Sunni youth, is alienating local populations by over-the-top violence and harsh implementation of Sharia, is unable to expand into territories controlled by functioning states, and does not possess the expertise required to form a bureaucracy and effectively govern. In reviewing the effort, a third school of thought emerged: that the real challenge is not ISIL the organization, but the sense of disempowerment, anger, and frustration in the Muslim world. This is evidenced by rising Islamist fundamentalism across the Muslim world combined with a declining sense of state-based nationalism. It is fueled by the perception of inequality and thwarted aspirations in addition to the conditions mentioned earlier in this chapter: failed states, demographic shifts, unemployment, drought, spread of communication technologies, etc. If the problem is larger than ISIL, then solutions that only seek to undermine ISIL’s capacity to control are insufficient to address the underlying cause of conflict.